What took me two months to accomplish can be viewed here in less than four minutes. Many thanks to Chelsea K Vance, for creating this video. For more complete information about the triptych, Cymbeline, you may read my previous post. 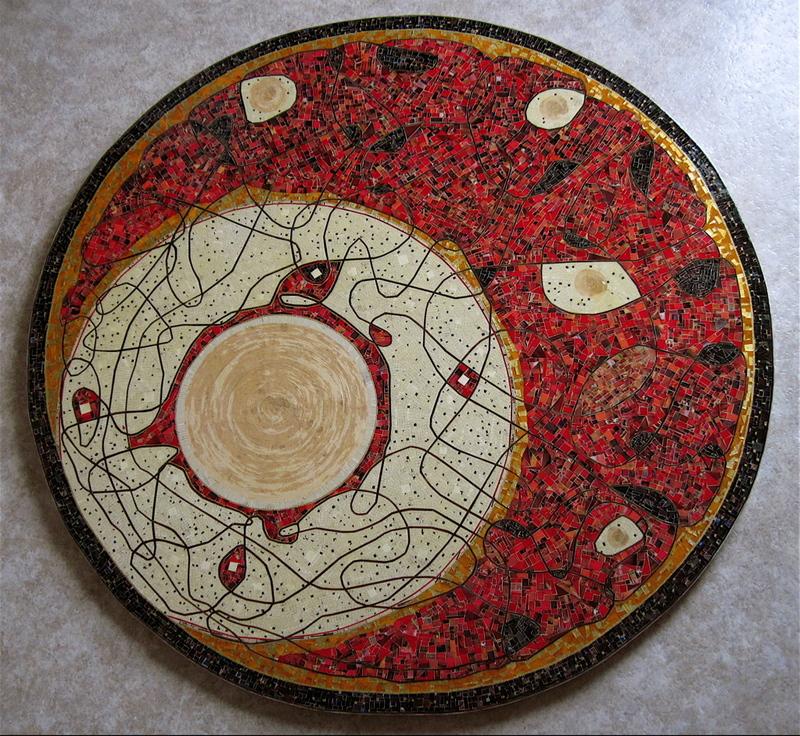 Mosaic paper collage on wood with polyurethane finish. 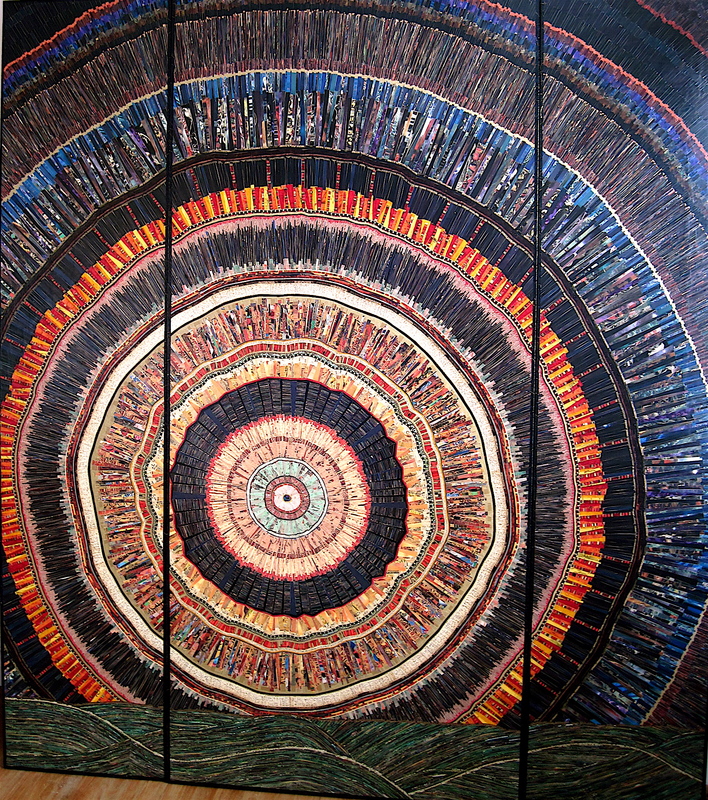 Mandala triptych 72″ wide x 80″ high, overall. You start in the center. 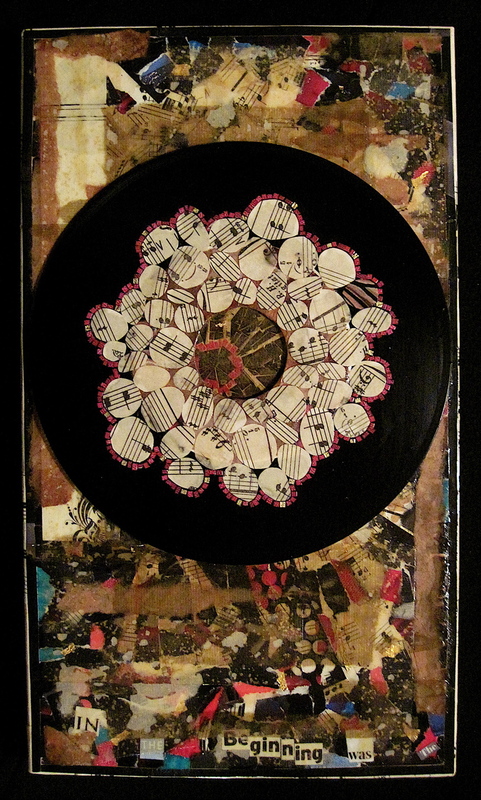 The collaged mandala triptych, Cymbeline, is the long answer to that simple-enough conception. In the case of Cymbeline the center is off-center, a little low, a little to the left, a little unround. 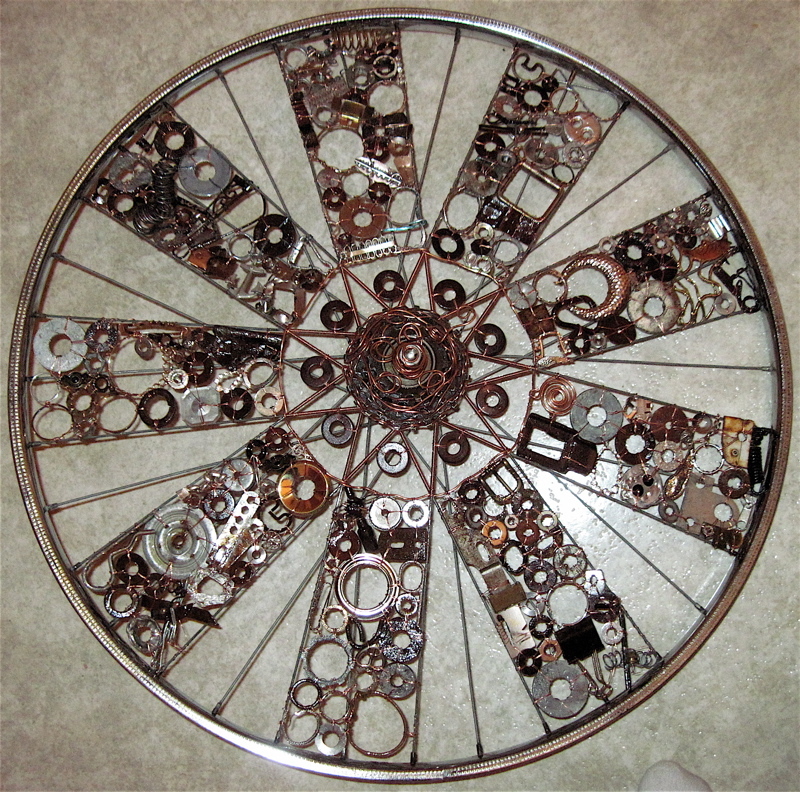 The process of working out from a central point provides the creator of the mandala–any mandala–the experience of many mandalas as the piece, in its multiple stages of wholeness, grows more complex. 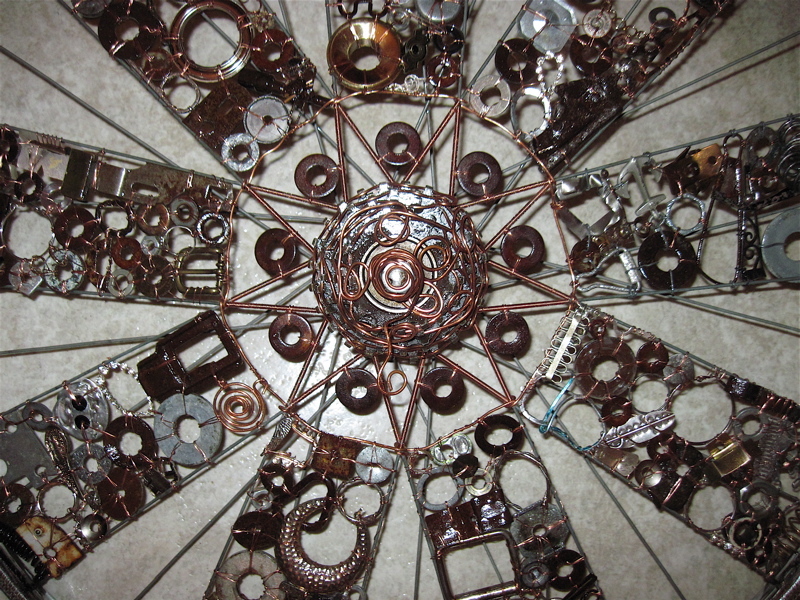 To create a mandala is to participate in a way of natural growth, observed in the patterns of atoms, cells, trees, rocks, sound, cities, planets, solar systems, physical forces, and much more. Things radiate. Cymbeline incorporates thousands of small pieces of paper–bits and strips handcut from a variety of papers, mostly recycled, including old art calendars, magazines, books, art-auction catalogues, and music. More than eighty rings radiate from its small, dark, less-than-an-inch-in-diameter heart. Every piece of paper in these rings, as well as in its center, has been cut by hand with scissors, thus preserving the slight natural variation of similar pieces not delivered by a shredder or paper cutter. The mandala rings include papers cut from outdated calendars of antique maps, African textiles, medieval art, and Georgia O’Keeffe (no relation to the artist) florals. Papers from discarded books in German and English also appear, along with interesting end papers (red and black, about 21 inches from the center), and strips from old sheet music. 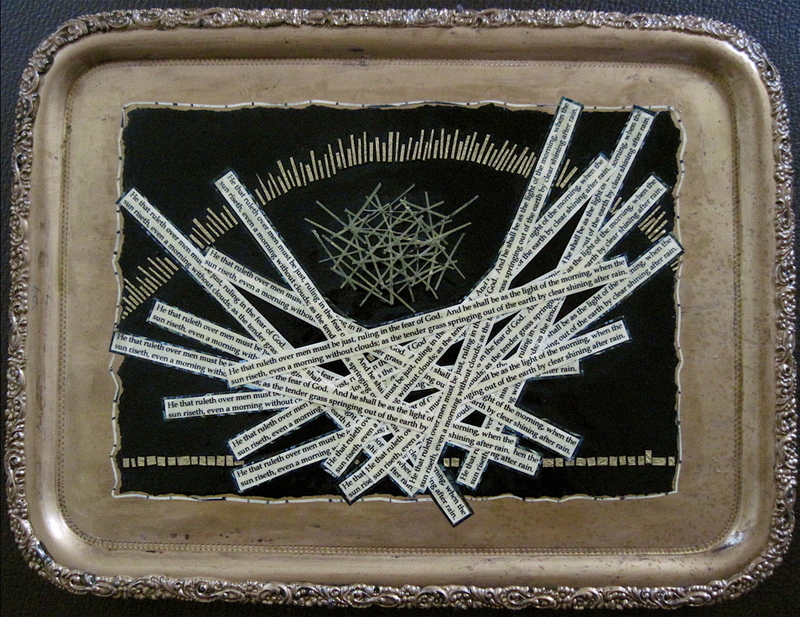 About 19 inches from the center, a wide ring of asemic (“without meaning”) writing spontaneously penned by the artist contrasts with adjacent dark bands. While certain of the primitive-looking characters seem to repeat, they have no assigned or consistent meaning; attempts to translate that “text” will prove futile. In the ninth band from the center the viewer may find words (read clockwise, from the top of the circle) from the prologue of an unpublished novel by the artist. There is no end not beginning. Always beginning in the end. Breaking the heart of the sky. The mandala encompasses a universe of mystery and meaning. In particular, Cymbeline (Celtic/Gaelic, “sun lord”) is a world created through a marriage of passion and patience. Although people frequently comment on the artist’s patience for meticulous detail, they are less apt to note the passion–indeed, the impatience with what exists–that presses her to continually work at the edge of what is coming into being, passion that energizes the long process of realizing a work. Cymbeline gathers art, music, literature, nature and, surprisingly, a bit of intuitive geometry and physics, into its sphere. “It is more than I know,” says O’Keeffe. You may view a brief news interview with me in my booth at the 2018 Ford Arts Beats & Eats art show through the following link: http://www.fox2detroit.com/news/357072037-video. Please enjoy this brief video interview with collage artist Deborah O’Keeffe introducing a major new work, Cymbeline: The Fiery Giver of Life. This video was produced by the Staunton Media Lab, which makes video profiles of artists, authors, musicians, actors, or other creative people at very affordable prices. Visit the Staunton Media Lab today and get your profile made! Collage artist Deborah O’Keeffe explains where to start when making abstract art. 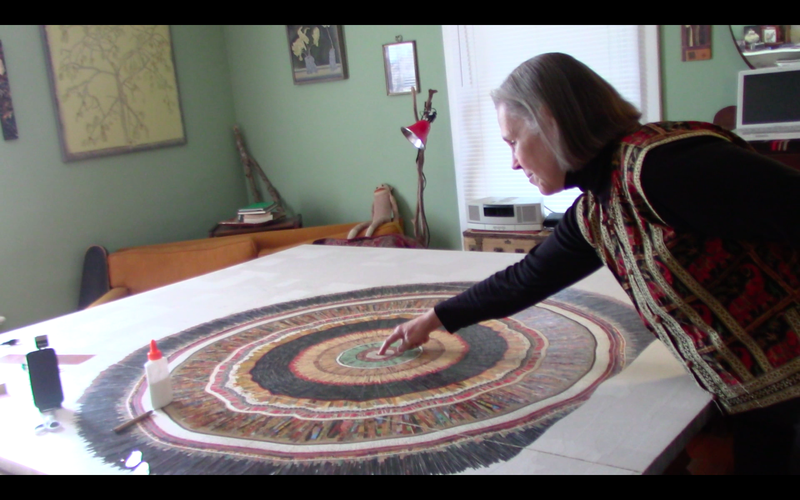 She’s shown here in her studio during the making of her largest work to date. Photo January 2016 by Steve O’Keefe – copyright free. The link, below, should play a three-minute audio interview with collage artist, Deborah O’Keeffe. In the interview, Deborah first introduces herself and her methods, and then quickly enters a discussion of how her work affects others. She introduces a mammoth new collage and explains how she “grows” a collage without knowing where it’s going. Collage artist Deborah O’Keeffe. Click on the image or the link, below, to hear an audio profile of the artist. Photo by Steve O’Keefe – copyright free. This three-minute audio was produced by the Staunton Media Lab, a vocational program in audio and video editing for the blind, deaf, and uniquely-able. Founded by Deborah’s husband, artist assistant extraordinaire Steve O’Keefe, the Staunton Media Lab wants to make your profile. Their rates are very affordable and they use your assignments to teach editing to the so-called disabled. To get your profile made, or to find out more about the Staunton Media Lab, contact executive director Steve O’Keefe or visit the SML YouTube channel. In December, 2014, I met Joan, a ceramicist, at her studio at the Torpedo Factory in Alexandria, Virginia. When Joan learned I was a collage artist who made book art, she gave me a small bagful of the writings of a homeless man she knew. The man, who got his paper from the towel dispenser of the Torpedo Factory’s public restroom, regularly recorded his social complaints–the same ones, over and over again–on those towels with ball-point pen, and brought them to Joan at her studio. After a month or so of consideration, I got an idea for a major piece, Lamentations. Although the man’s handwriting was often illegible, and his thoughts often unintelligible, there was something in this writer’s voice that I understood and connected with the despair and marginalization experienced by some of the Old Testament prophets. Looking at the book of the Lamentations of Jeremiah I saw, particularly in chapter 3, how that ancient prophet and this modern homeless man both felt outcast and deeply troubled by the social/political order of their time and place. So I linked the two writers in this abstract collage. The white column that runs the vertical length of the piece is made of strips of those paper-towel writings–about three layers of strips glued down over the base layer of paper (pieces torn from pages of an old dictionary). The narrower, very dark red strip that also runs the vertical length of the work contains the text, handwritten, of Lamentations 3, although after varnishing the text almost completely disappeared, which was fine; it remains there physically and, more important, its spirit pervades the piece. Embedded in the fine mosaic collage on the left side of the work is the Hebrew alphabet, in order, just as the book of Lamentations was written as an acrostic in the original Hebrew. I am no great philanthropist, or particularly good at relating to people who make me uncomfortable, but it touched my heart to respect this homeless man in this way, and to maybe see something deeper in his purpose than can be intellectualized. The portable* display I take to art shows includes a variety of quickly readable statements about mandalas, collage, and art in general. 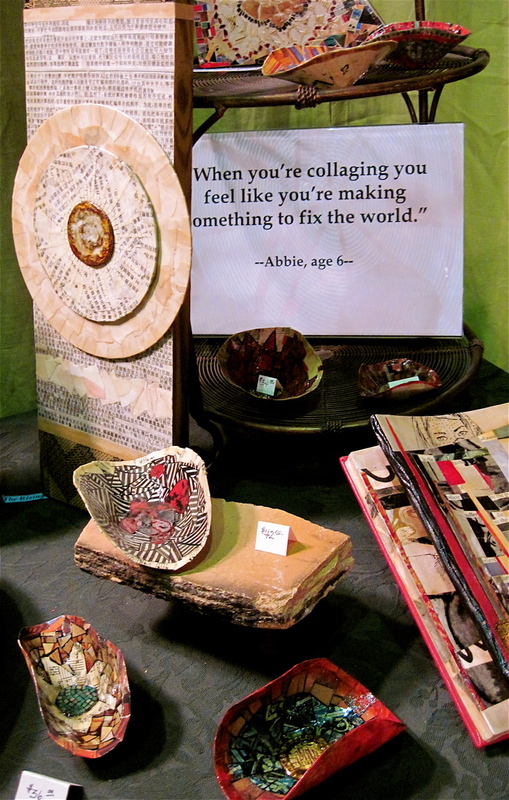 One of the most commented upon quotations issued from my young friend, Abbie, who offered me her wisdom on a Saturday morning in January as we were collaging mandalas together on paper plates. Risking redundancy, I now repeat what you can mostly read in the above photo: “When you’re collaging you feel like you’re making something to fix the world.” Abbie was 6 when she said that; I am compelled to tell you that at this writing, she is 7, for every bit of age is important to Abbie at this point in her life. To Abbie, as to many children, small things make a big difference. 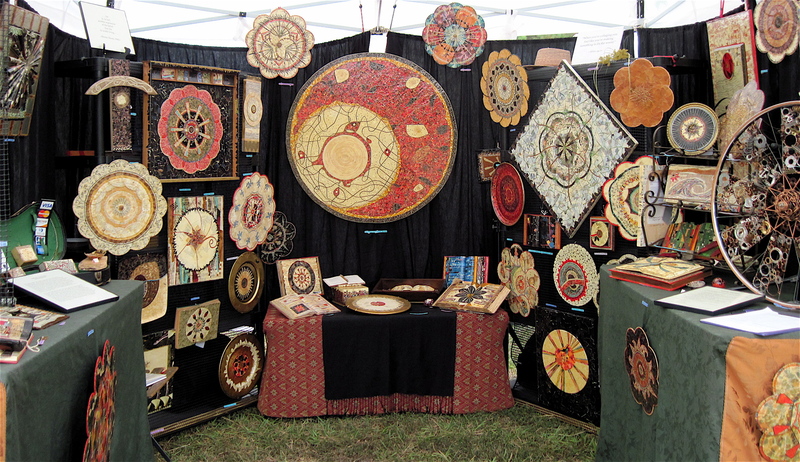 If people who visit my booth smile when they read Abbie’s statement, they are incredulous when I show them a sample of the raw materials from which I create the mandalas, altered books, and other art works covering the walls and tables of my 10′ x 10′ space. Like most normal, tidy people, I used to throw such paper bits in the trash. Now my chosen profession has created in me a consciousness that compels me to save the scraps, and sometimes even the scraps of the scraps, because I know what they might amount to collectively after 2 to 200 hours of artistic processing. For some reason I get a big kick out of turning what you see above into what you see below. My booth at an art show in Johns Creek, Georgia, September 3, 4, 2011. People who visit my booth at art shows often tell me that I have the patience of Job. Actually, I don’t. I’ve been known to slap machines–cars, computers, radios, CD players, etc.– that were not working according to my pleasure; it drives me nuts to get stuck behind slow walkers when I want to move fast. Anyway, I know that Job’s patience was not that of a bean counter, but an existential, life-bending, faith-stretching patience burdened with extreme suffering. If Job and I have anything in common, it is that we believe with all our hearts that the unpromising details will amount to something in the end, and we are usually rewarded. Despite the fact that I am a woman of only average patience, I love this often-tedious work that I do full-time, every weekday, sometimes on Sundays, and even on my birthday. Strangely, collaging is one of the primary ways I fix the world, or at least my world, the world that is my life. I know that when I am feeling scattered, unfocused, at loose ends, maybe even a little worried, creating a small, beautiful-to-me object will help to center and settle me and put me in my right mind, which is not my fearful, calculating mind, but my creative mind. I feel small in the cosmic scheme of things, and what I do seems likewise small. Recently, however, I was reminded of what meteorologists sometimes call “the butterfly effect.” The idea is that a butterfly fluttering its wings in, say, Beta Ho, China, where my mother used to swim as a child, might radiate a shift in air currents that could telegraphically alter the weather in, say, La Jolla, California, where I used to swim as a child. It is, of course, difficult or impossible to measure and track the many slight influences that add up to weather, or a mood, a nice day, or a good life. But I believe we must believe in them and consider that our own small part in the scheme of things may not be as small as it seems. When Bill Moyers asked mythologist Joseph Campbell how one might save the world, Campbell directed Moyers to one’s most local and seemingly minor concern: one’s self. “The influence of a vital person vitalizes,” said Campbell. “There’s no doubt about it. The world without spirit is a wasteland. . . . The thing to do is to bring life to it, and the only way to do that is to find in your own case where the life is and become alive yourself” (The Power of Myth, p. 149). Creating is an act of spirit involving love, faith, and risk. Collaging is my passion, my way of creating. People sometimes mistake creativity as the province of artists alone. That is not so. Creativity is for everyone, whether artist, parent, teacher, physician, farmer, scientist, carpenter, engineer, secretary, waiter, politician, writer, software developer, business owner, minister, or even first-grade student. The world has benefitted from the creative actions of people we have heard of and even more from those we have not. All together we may not only fix the world but make it, in our own way, beautiful. *”Portable” means that two people spending an hour loading, arranging, re-arranging, and sweating, can fit the entire display plus themselves into a Honda Odyssey without having to tow a trailer or tie things to the top of the van. I don’t know whether it was a sign of strength or weakness, but I was halfway through the creation of this large collage, The Marriage of Sol and Luna, before I realized what I was making might be symbolic of a lunar eclipse. Days after that I learned a lunar eclipse was soon to occur, in a rare coincidence with the day of the winter solstice. At that point I was within striking distance of finishing the work, which took me nearly a month of long days to complete. Thus it was with conscious intention that I laid down the last of what seemed like a million (probably closer to 10,000) tiny collage pieces within one hour of the occurrence of the solstice, on December 21, 2010. The dark lines which curve throughout the piece, dividing it into many smaller sections, are in fact a single line which I made at the outset, never picking up the pen until the line, through its labyrinthine twists, turns, and undulations, was finished. I established the area of the inner white circle by tracing a 78 vinyl record. The template for the larger white circle was an enormous quilting hoop that once belonged to the grandmother of my college roommate. Part of the ongoing, and sometimes difficult task of the artist, is to cooperate with this process, rather than imposing one’s self in a way that occludes or subverts it. “Mandala: Gran Cirque”, a photo by ameliamandala on Flickr. 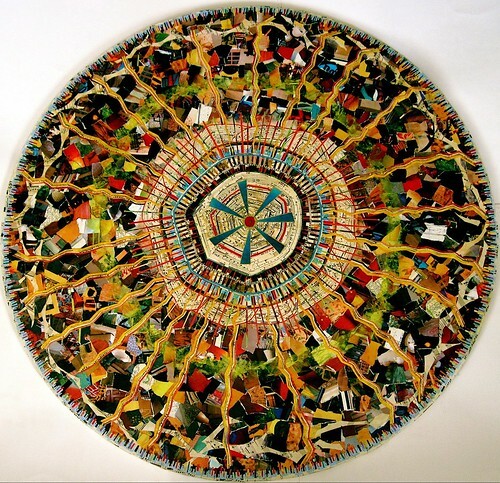 Mandala, 44″ diameter, paper collage, created by Deborah Norsworthy for March 2010 exhibit “6 @ 549,” at Gallery 549, Lafayette, Louisiana. Now held in private collection.